I seem to get myself into these kinds of pickles, pickles that involve promises I make that I never feel like I will have to keep. 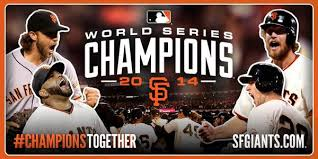 Two years ago, my daughters asked if they could dye their hair orange if the Giants went to the World Series. I had no expectation that they would actually go, but they did, and I spent two nights in my bathroom wearing rubber gloves painting hair with a pastry brush and surrounded by rag towels. This year in addition to the obligatory hair dyeing--yes, again with the gloves and the rag towels, oh, and this time my daughter brought two friends with her AND I dyed my hair too---my kids offered up this proposal, "If the Giants win the World Series AND the parade is on Halloween, can we go?" Once again, having no expectation I would ever have to own up to my promise, I told them we would go. The Giants could have won the World Series on Tuesday, October 28th but instead they were obliterated by the Royals 10-0. They waited another day to finish the work, behind the masterful pitching of MVP Madison Bumgarner. We paced and held our breath and screamed and drank the champagne I had put in the freezer about the seventh inning. The next day I got AM text that the parade would be on Friday at noon, and, by the way, there was 100% chance of rain in the hours leading up to it. Were we really crazy enough to do this? I didn't have work and it was Halloween, an all but wasted day at school, no water polo, no rehearsal. Our only commitment was at 6pm, dinner at our house with our friends. But oh, the logistics that had to be arranged on short notice! Carpools rearranged, attendance desks called, appointments rescheduled. How are we going to get there? What do we bring? Where are we going to set up all along the parade route? What time do we leave? What do we do about the rain? Oh, and by the way, even though we only have room for two, can we take James AND Juliana AND Serafina? The next hours were a flurry of consultations with the internet and hurried texts to friends who had done it before, jumbled with calls, a water polo game and making dinner. Finally it was self examination which asked, "When might we ever have the opportunity to do this again as a family?" That sealed our fate. We were going. Apparently we were this crazy! We rose at 5:45 am and left our house at 6:30 am to pick up Natalya's two friends in Los Gatos. Yes, we drove. First inclination would leave one to believe that driving to the city the day of the parade would be the most ludicrous thing a body could do, but not so. On the advice of our friend, we accessed a website, ParkWhiz.com, the night before and not only reserved but paid for our parking space for the day just 6 blocks from Market Street. There was very little traffic, and by 8am we were headed up the street to the parade route. Our first stop, the potty inside a little McDonald's. Take advantage! This might be your last chance at a rest room! Parked in San Francisco and ready to cheer!! By 8:20, we had parked ourselves right up against the guardrails on 6 ft of curb, somewhere in a nasty area of town between Taylor and McAllister, close to the end of the parade route. It had been raining so we spread out plastic bags to protect our rear ends, and sat down for our four hour wait. It wasn't so crowded and unsafe that you couldn't wander around a bit. The girls walked to Starbucks (did I really let them do that??) and played games and texted. The wait did not come without its share of agony, though, which could be summed up as weather, water, and weed. 100% rain was promised and 100% rain came. It rained steadily from 9 to noon and for 45 minutes it rained hard. The plastic bags lining the curb filled and flowed with rain. We stood huddled under 6 open umbrellas, each of us trying not to pour water onto the person next to us, or worse, poke out someone's eye. Someone had given us the great idea of taking a covered baseball bucket to sit on while we waited. This turned out to have the added benefit of storing our belongings in a waterproof place! Great seats, but a long time to wait! As natural processes progressed, the problem of where to use the rest room also became a problem. It became very clear that no business was going to let parade goers use their restrooms. It was suggested that we go into the BART station but I sure didn't want the kids going alone. Port-a-potties were apparently set up in the alley ways, but I never found them. Ally was getting pretty complainey about not being able to hold it much longer. Eventually the girls found a closed tenderloin one teenager operation pizza parlor who begrudgingly allowed 3 of the girls to use the facilities. Natalya texted me with the discovery and I joined. The bathroom was gross but it was better than BART. I tipped the kid $10 when I left. Oh and gosh the weed! This was a lost battle. Everyone was smoking it and the cops didn't even care. Apparently they had bigger fish to fry. I finally see Lou Seal!! After 3 1/2 hours of rain, pot smoke and worrying about quickly filling bladders it was time for the parade to start! But we were down at the end of the parade route and the parade didn't get to us for another 50 minutes! Ugh! Finally Lou Seal was in sight, at the head of the procession down Market Street. There is definitely a lot of filler in this parade; front office staff, season ticket holders, some ridiculous cheer team. The players were paired on party buses, on which they rode with their families on the upper decks. Timmy rode with Javi Lopez. Hunter Strickland rode with Tim Hudson. Buster Posey and Santiago Casilla rode together. They waved and smiled as they rode by. Giants alumni like Willie Mays, Juan Marichal, Barry Bonds, Orlando Cepeda and Gaylord Perry all made appearances in chauffeured open cars. Lots of vehicles threw candy and Tshirts and other paraphernalia and being in the front we caught quite a bit. The parade went on for about an hour, wrapping up with MVP Madison Bumgarner in an open fire truck followed by Bruce Bochy carrying the World Series trophy. My girls snapped pictures constantly. Their pictures were far better than mine and most of the credit for the photos in this post belong to them. As rush hour was approaching, we decided not to go to Civic Center for the speeches, but getting back to our car was not easy. We were on the far side of the street. and the only way to cross the street period was to descend into the BART station three blocks away and emerge on the other of Market Street. Well, everyone was in the BART station, either trying to get on BART, trying to enter the mall and go to the bathroom or to do just what we were trying to do. The crowds in the BART station were the nastiest and the worst we had seen all day---wall to wall mob. We left San Francisco about 3pm, had a straight shot to the freeway, and were home by 4:15. We listened to the Civic Center event in the car on the way home, so we really didn't miss anything. What a day! We have Halloween after all this? The parade was insane but we are glad we went. Maybe in two tears we will have to ask ourselves again if doing it once was enough! Thank you for reading this post! Now I've been to Disneyland dressed for the holidays too! How am I going to keep up? Stay tuned!